I wake up just in front of my 5:30 alarm, a sign that my "early-to-bed" strategy is working. The wind is blowing like hell, and the sky isn't light enough to determine whether it's going to be clear today or rainy. This is my excuse for taking ages to get in motion. It's 6:45, when I'm finally out of the hotel; I still haven't had breakfast. None of the little restaurant kiosks along the lake are open, so I start biking to the border. The first sign that I'm near the border: a long column of parked trucks. I ride on. A truck-guy calls out something about exchange, but I continue. I come to a set of buildings. There, in front, is a small food-cart, and I see some rolls, so I stop. 2 TL for four rolls annoys me, but I need food and I don't need Turkish Lira, so buy the rolls, and two teas. A young man spots me, the foreigner on the bike, and comes over, flashing a wad, three or four inches thick, of currency. He asks if I want to exchange. I ask the rate and I'm told 100 Turkish Lira equal to 3,100 Syrian Pounds. I ponder this, then take out my remaining Turkish currency: 65 TL. His wad, plus his willingness to deal pretty visibly (there are a dozen soldiers just ten meters away) causes me to trust the legitimacy of what he's going to hand me, and to somewhat trust his rate. I ask about the rate for US dollars and am told 47 Pounds. He indicates that banks are doing 41 Pounds. I don't know, but I get rid of the Turkish Lira and exchange five $20 bills for another 4700 Syrian Pounds, then I trade him back the bills he's given me asking for smaller denominations. Armed with bread and cash, I bike up to the first line, where there's a small crowd milling about. One man jives me about bicycle paperwork, but at least points me to a correct line. That, I learn, is the queue for checking out of Turkey. I take care of that, bicycle away though a construction zone and come to another check. I show my passport, but I'm given it back. "Stamp?" I gesture, and he waves down the road. I continue biking. I pass another long column of trucks (these pointing my direction, towards Turkey), I spot a control, pull over, but he waves me on. "Three kilometers", I'm told. Wow - I'm quite surprised by the size of the "no-man's land." Finally, I'm at another set of controls and a building. I'm directed to go into a certain door. I lock the bike and do so. I hand over my paperwork and passport at the window labeled "Foreigners" and watch as a couple of officials from the Syrians window and Arabs window gravitate down to check out the passport of the guy who's dressed funny (me). I'm given a form to fill out and I wait. A carload or two of travelers come in, are processed, and disappear. About an hour later I'm still waiting. It's maybe 8:30 or so in the morning; I forget. I'm still in front of all the trucks however! I guess that they don't see many bicyclists. My passport is stamped, and I'm waved away. As I bicycle away from the border, I see some old ruins at the side of the road. 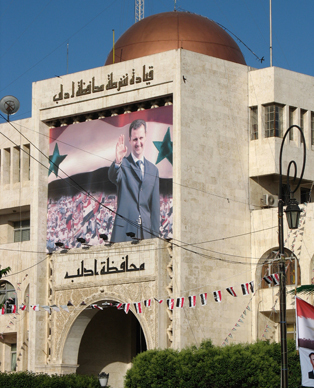 I'm in Syria, and this is going to be a great experience! I'm very glad I converted some money since I see no exchange. I'm also glad I bought those four rolls since I see no food. I do come to a stretch of kiosks that seem half-open and I buy a 1.5 liter jug of water for 50 Syrian Pounds. 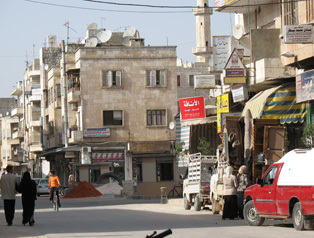 There's good signage for Idlib and I've got water, bread, Syrian currency and bedding. Life is good. The road surface is brand-new-perhaps the smoothest I've been on. But all of the sudden it becomes the about worst road I've been on. This surface is torn up and scraped down-I guess I'm in the middle of the resurfacing project. I drop off the asphalt onto the dirt edge, but that surface is wet-with fresh tar, it seems. Very quickly I have tar speckles on most of me, and most of my gear. I ride on, pull over for a few snapshots of a man with a plow that appears to be from biblical days, then continue. I'm at Idlib before noon. At the first big traffic circle I ask "Otel?" and I'm pointed across the circle and up a busy one-way street. I ride up that road and ask "Otel?" every block or so, following hand signals. Eventually someone assigns a nearby bicyclist to take me somewhere (a hotel, I hope), and, perhaps eight blocks away I'm left off at a tea garden. They, in turn, indicate that I need to go outside, and around the corner. Now I'm at the hotel. The room's fine, it comes with a bath, shower, refrigerator, desk and even air-conditioning, and I take it for US$15. I'm even given two towels, a true luxury. I shower, get back on the bike, and follow my exact path in reverse to the museum at the traffic circle, and spend an hour or so there. On the grounds behind the museum, I snap a few photos of the antiques stacked in the garage area. I work my way back to the hotel, but somehow I can't find it. I've got the key and I've written down the name of the place, but still-this is annoying. An ice cream vendor on the corner calls for my attention and we end up talking for over a half-hour. Politics pops up quickly and the crowd is pleased to learn about my displeasure with Bush. I shift to Iran's growing power and ask if Syria is Sunni or Shia. I'm told that the walls have ears and the man is clearly uncomfortable with the way the conversation is going. This is interesting. Meanwhile, he's given me an ice cream cone, then some large, heavy pastry. With everyone watching, I have to finish them both, but both are a little too sweet for my empty stomach. A young boy, whose English is probably the best in the small crowd that has gathered, offers to guide me back to my hotel. We go past my hotel, as he wants to show me where he lives. After another ten blocks, I explain to Muged that I need to get back to where I'm staying. He asks what I'm doing later, and insists on coming back to show me his town. I agree to join him outside my hotel at 7:00 pm. He gives me his phone number, I guess to confirm plans. Back at the hotel room I feel ill for the first time this trip. I'm thinking it's not the a typical stomach problems, but probably simply the free ice cream followed by the free sugary pastry filled with what must have been a pound of cheese. I pop an Imodium, and doze. The alarm goes off an hour and a half later, and I snooze-it a few rounds. I'm finally up, and feeling better. I guess I'm supposed to phone Muged. He was very nice, and I don't want to stand him up. The hotel matron guides me downstairs to a lobby phone, dials the number, and talks to someone. Apparently, Muged has headed to my hotel. Perhaps, ten minutes later, three boys show up at my open door, smoking, trying to look tough. Lord-these kids are 10 or 12-years old-they look like children dressed up for a 50's revival show and I'm embarrassed-and wondering if my associating with them makes me look a little… suspect. I reiterate to the hotel matron that these are my translators as we head out of the hotel. The wind is blowing fiercely. Just across the street, ten meter-long banners, up for some kind of celebration, have been torn off their ropes and are flapping wildly in the wind. I'm worried about the ride tomorrow. We round a corner; where I spot a kiosk offering photocopying and what seems to be an international telephone kiosk. I ask my translating team, and they determine that I can call the US from here, and that the booth is open until 10pm. Great news! We continue our tour of the town, and as we walk back I buy bananas. 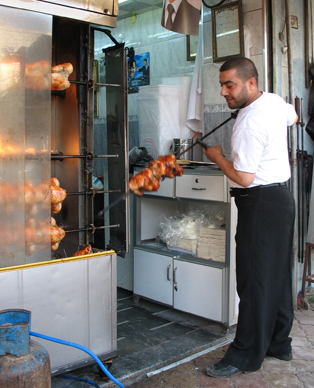 At a kabob storefront that I'd eaten at earlier in the day, I'm given bread; payment is refused. The generosity in Syria is just as they say, and I can only feel... guilty. Back outside the hotel, I bid the boys goodbye and head upstairs. I set the alarm for 5:45 am, but don't pre-pack, so I know it's going to be slow exit. 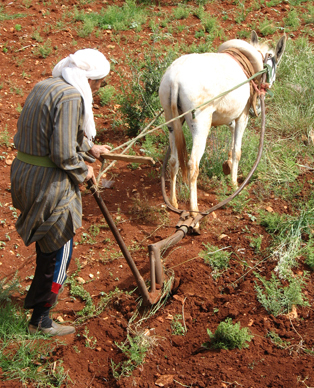 My first photo in Syria - the ancient plowman. 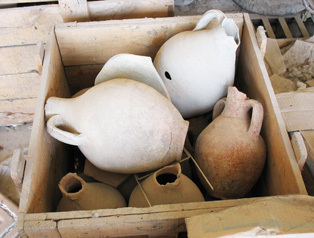 Antiquities, stored outside the Idlib museum. Banners, posters and streamers were everywhere.